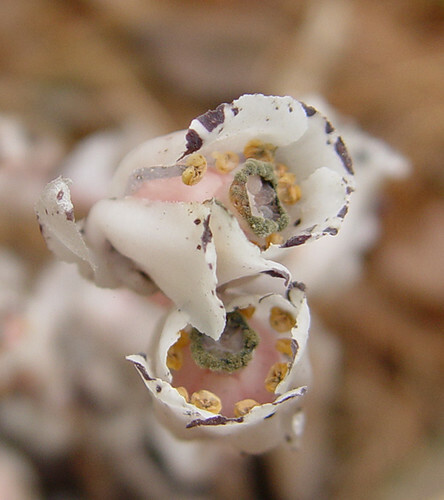 From this web site: The Indian pipe is not a fungus, as its appearance would at first suggest. It’s a flowering plant related to the dogwood, evergreen laurel, and rhododendron. The Indian pipe is a saprophyte, living chiefly on the decaying roots of other plants, particularly trees. Indian pipes are most often found near a dead stump in deep woods. Some botanists believe that the roots work in symbiotic conjunction with certain soil fungi to supplement its diet with food from live tree roots, which would make the plant a parasite as well as a saprophyte. The plant’s flesh turns black when cut or even bruised. It also oozes a clear, gelatinous substance when picked or wounded. Such unattractive characteristics have earned the Indian pipe some unflattering names, like ghost flower and corpse plant. Indians employed it as an eye lotion — whence the name, eyebright – as well as for colds and fevers. Americans of the last century treated spasms, fainting spells, and nervous conditions with it — thus the names convulsionroot, fitroot, and convulsionweed. Well damn, I just learned something!!! Very cool! Eye lotion? Like for crow’s feet? Probably wishful thinking . . . I remember hearing “eyebright” on an animated movie, “Once Upon a Forest”…where Uncle Cornelius had his students go find eyebright in the meadow, so he could help heal his niece’s eye wounds. Now I know it is not only “real”….but called Indian pipe! Cool PhotoHunt! I learned something new !! Very cool! I’ve never seen such a plant! that’s a great way of interpreting the theme! I feel like I went on a little nature walk I had no idea about any of that! What a cool plant! I’d never heard of it. I learn something new every day! Happy photo hunting! Gosh that’s a beautiful photo. Have you thought about creating a wild flower calendar? Or maybe entering this for a calendar? It’s gorgeous! I wouldn’t have been able to tell what that was! Lovely photo and nice information. That’s odd. I also ooze things and turn funny colours when I am injured. very cool shot….goes to say you learn something new every day. As for the b’day question you asked: Not too sure as of yet…..the watch is still in the running. How’s your’s going? Wow, those are crazy looking! I’ve never seen one before, I’m sure. I’d remember something like that. I just learned something. Interesting. Brilliant deail and a great picture. I don’t think I’ve seen those before.